Pre-listing home inspections are worth every dollar and more! Pre-listing home inspections from Seattle to Wenatchee, Leavenworth and Lake Chelan. Ready to sell your house? Give yourself an edge in this tough market with a pre-listing inspection. Sell your home faster! Put your best foot forward from the beginning and let buyers know that you have nothing to hide. Eliminate price negotiations based on the buyer’s inspection. If you’ve priced the home based on the pre-listing inspection’s findings then you’ve decreased the reasons for price negotiations after mutual acceptance. Avoid walk-away buyers by removing surprises. Frustrated buyers will often walk away from a deal when the inspection report exposes concealed repairs. The price is right! Resolve all issues before the house goes on the market and price it accordingly. Don’t want to fix it? Reflect the current condition in the listing price. Increase profits when you have completed the repairs yourself. Even minor findings in the buyer’s inspection can result in profit losses. The buyer will frequently provide the higher contractor bid while you would have chosen the best value bid. 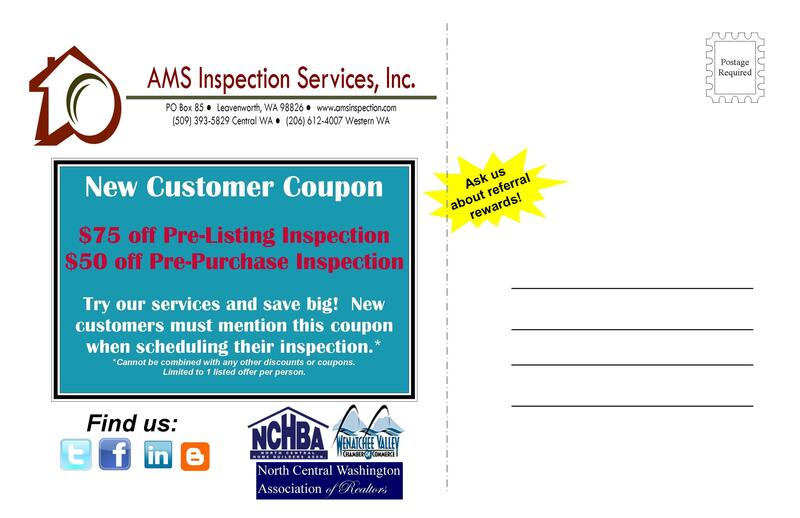 HERE’S A COUPON FOR YOUR PRE-LISTING INSPECTION! 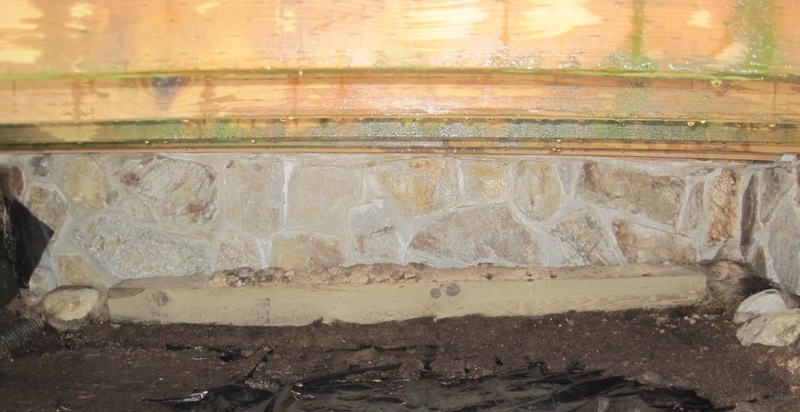 Wenatchee Home Inspector Photo: Do you see the problem? At first glance you may think the green algae is the issue in the photo, but not really. This photo was taken under an exterior deck and algae is typical in those areas. The real concern is the wood laying on the ground next to the home. This a great place for wood destroying organisms to start residing and to begin gaining access to your lovely home. Carpenter ants love decomposing wood! This picture was taken last week at a Lake Wenatchee Home Inspection. 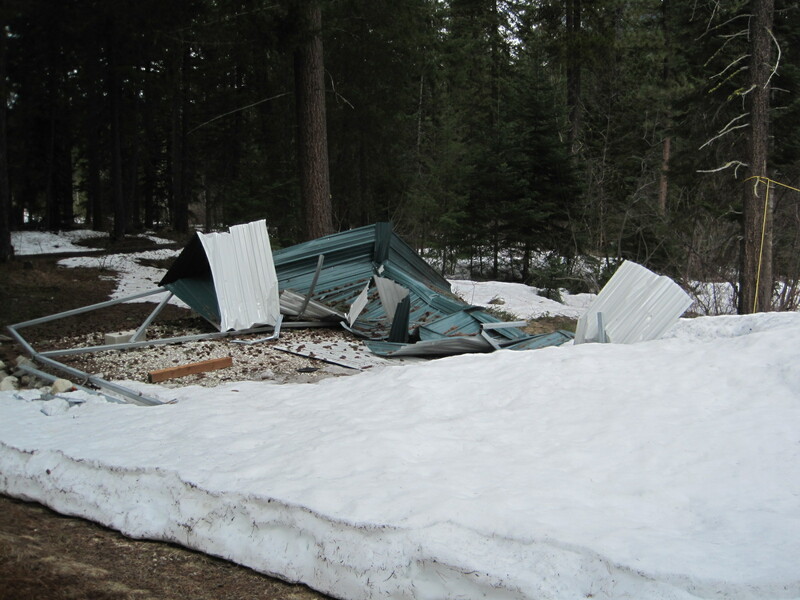 The metal carport was no match for the heavy snow we received over the last winter. Notice how much snow we still have there…in April! This week one of our staff went to a WSU Extension Energy Program training in Wenatchee with a focus on duct sealing and testing requirements for the 2009 Washington State Energy Code for HVAC: 503.10.3 Sealing. We have two Energy Star Performance Technicians on staff so this class was more of a refresher course on duct testing but we did benefit from understanding more about the changes to the new HVAC requirements. Basically, the code is in a trial period. Contractors must test the HVAC now but do not have to meet the target rate of allowable leakage during this 120-day testing period. In April 2011 a judicial committee will listen to arguments from all sides and make a decision about the 503.10.3 Sealing WA State Energy Code. We performed a HVAC leakage test on a home in South Wenatchee. The new construction home performed well. It would have passed the new requirements. It was interesting to note the small leakages that could be easily fixed by mastic. The equipment used for testing the HVAC includes a duct blaster, manometer and blower door which could add up to $5,000. This is a new expense to contractors. There is also discussion about requiring third party testing due to conflict of interest. Should HVAC contractors be able to test their own work? Here are a few interesting facts we learned in class this week. Did you know that 40% of a home’s fresh air comes from the crawl space or garage? Thinking about cleaning those spaces right now…aren’t you!? This is also a good time to remind you to open your garage door any time the car is on. A family of four can emit up to 3 gallons of water into a home daily from sweating, showering, cooking, etc. Where do the 12 gallons of water go? Be sure to use your oven and bathroom exhaust fans regularly! The Seattle Home Show opens its doors for its 67th annual home products extravaganza on February 19, 2011 for a nine-day run through February 27. This much-anticipated show of nearly 500 exhibits includes everything for the home and landscape, highlighted by Idea Street™ – a community of furnished and landscaped model homes. Idea Street is a showcase for home design, interior style and the latest appliances and fixtures. Show attendees enjoy the variety and scope of the exhibition which includes green living displays, kitchens and baths, home decorating, arts and crafts, garden displays, and Meet the Expert Seminars featuring home improvement topics presented by industry professionals. 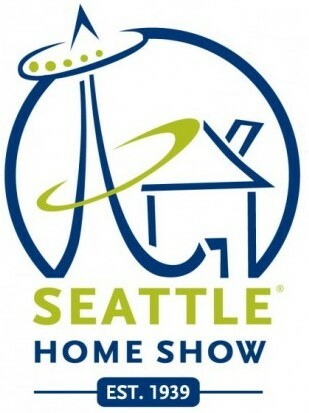 America’s Biggest Open House™ – the Seattle Home Show – takes place in downtown Seattle at the Qwest Field Event Center. Details at www.SeattleHomeShow.com.